At Think Cooling, we’re a top choice for Gold Coast AC solutions. We deal with trusted providers of high-quality products and services fit for all your Helensvale air conditioning needs. There are some regions within the Gold Coast that have experienced a surge in population and development in the last 5 years or so. Hope Island is one such area, and neighbouring Helensvale attracts plenty of new buyers too. Anyone moving to this area needs the best air conditioning Helensvale has to offer. This means reliable, effective climate control in luxury apartments, family homes and other new builds. Our team at Think Cooling provide air conditioning Hope Island & Helensvale residents have loved for many years. Why Choose Think Cooling for Helensvale & Hope Island Air Conditioning? Flexibility is essential for any home service. We can’t set a time that is convenient for us in the middle of the day and expect busy workers to drop everything and rearrange their schedules. That is why we want to provide appointments at a time that suits you. We want the whole process to be as stress-free and convenient as possible so that you get the best experience. This is also why so many people in the Hope Island area turn to us whenever they need an AC system installed, maintained or an upgrade. Our skilled, friendly team is always ready to help whenever it is best for you. Both of these popular suburbs have seen a rise in population between the 2011 and 2016 census – one more rapidly than the other. Helensvale is up 5.5% in the 5 years between censuses, which is slow compared to other regions in the Gold Coast but heading in the right direction. Hope Island, on the other hand, grew far more quickly with a 31.9% rise in the same period. Hope Island has developed into a more established, affluent area where property owners want only the best in their homes. Helensvale, meanwhile, has proven to be a hit with those that want to commute into Brisbane. The distance is manageable and properties are more spacious and affordable for young families. Split systems are a popular choice for new builds with smaller, space-saving apartment blocks. Areas with such a sharp rise in population, such as Hope Island, need these kinds of high-capacity buildings if they are to keep up with demand. A multi-split system may be even more appealing for developers working with larger properties with minimal outside space. Whatever the style of the property, Think Cooling specialists can provide a great service and help you choose the most effective system for your needs. Then there are the systems for all those families buying and upgrading their family homes in this region. It is important to have an energy-efficient system that can meet the demands of all occupants in the home. A ducted system covers multiple rooms and provides an effective solution that you can rely upon. Again, you can be sure of great choices and services when you contact Think Cooling about the best ducted systems. There are many families that will turn to Helensvale and Hope Island as a place to commute between the city and their ideal home. It is always nice to know that you have a dedicated, reliable air con system waiting for you. This is especially true when stuck in traffic in hot weather. The smart MyAir system offers complete control for homeowners with different temperatures and airflows per room. Users can also adjust this remotely using a smartphone – such as while stuck in traffic after work. With MyAir, you know you’ll always come home to the perfect indoor environment for you. It’s the finest AC versatility, all at your fingertips! Ready to upgrade your AC? We know that time is precious. That is why we want to make the AC installation process simple. If you call us today, we can get the ball rolling and set you up for an appointment that is convenient for you. Alternatively, you can email us at a time that suits you to ask us about the great services and products mentioned above. Head over to our contact page for more detail on how to get in touch. 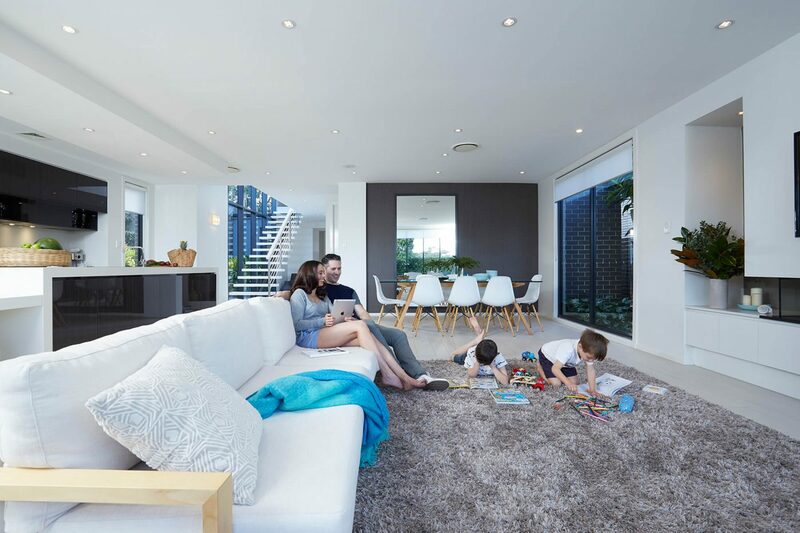 Before long, we can be fitting the perfect new system and you can see why Think Cooling air conditioning Helensvale is the best option for your new family home.